Bovis Homes has opened a new office in Exeter to support the growth of its operations in Devon and the rest of the south west. With new developments at various stages of build across the county - and with land opportunities springing up elsewhere to deliver much needed new housing stock - the return of Bovis Homes to Devon is a sign that the local economy is on the up. In fact, the business has restructured to ensure a focus on the local housing market and Deputy Managing Director of the South West (southern) region, David Farley, said: "Devon has traditionally been a heartland for Bovis Homes and, having been away for a few years, we have cemented our return with the opening of these new premises. "The move shows our long-term commitment to the region and we have a team in place ready to serve our existing developments around Devon, Cornwall, Dorset and Somerset, and to look for further opportunities to buy land for new homes. "We've already acquired some cracking sites; we're building some great homes in places like Cranbrook, Teignmouth and Dawlish and we're looking to build on these successes in the future." 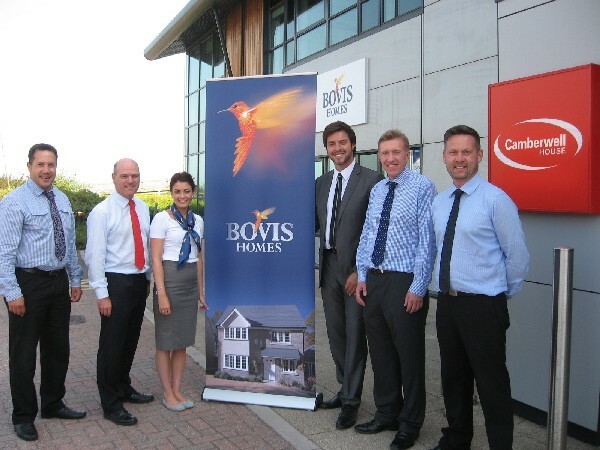 The new offices are situated in Camberwell House at Exeter Business Park and a number of local businesses came along to celebrate Bovis Homes' return at a special opening event. "The offices are in a great location - just off the M5 and with great access to some of the key areas that we will be looking to focus our activity on," said Dave. "It was great to meet up with contractors and business associates in the region, many of whom we will no doubt be working with over the next few years, and explain our business plan to them. "This is a tremendously exciting time to be operating here. There are a number of opportunities and having a presence in the heart of the area ensures that we are in the right position to make the most of them."